Pallet racking is a type of storage system. This type of racking is designed to hold pallets of stock normally at a large scale, in horizontal rows. Pallet racking is a great way to increase storage capacity as it stores the stock at multiple levels meaning one section of space can be used to store more than one pallet. There are many different types of pallet racking and choosing the right one for your business can be hard. Depending on the storage you need, the pace of your business and how accessible you need your stock to be will depend on which type of pallet racking you choose to invest in. Carpet Racking: Like it says in the name, carpet racking is a storage system that is capable of holding different lengths and diameters of carpet. Double Deep Pallet Racking: This type of pallet racking is ideal for warehouse storage as it stores the pallets in unit loads. It works on the same principles as wide aisle racking except it is stacked at each pick face. Drive-In Pallet Racking: This type of racking is extremely space efficient, working on a first in last out basis and working on a 0-metre aisle width. 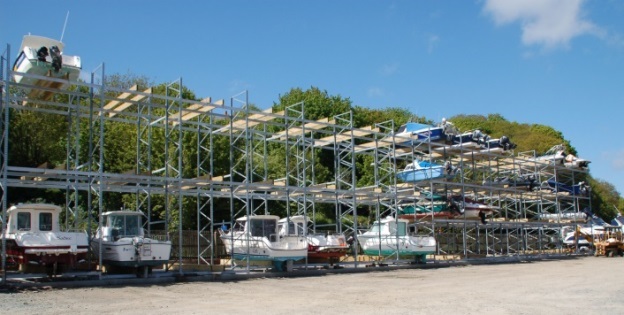 Dry-Stack Boat Racking: Storing your boat can be hard, but with dry-stack boat racking you can conveniently store RIBS and motorboats out of the water. Galvanised Pallet Racking: Galvanised pallet racking is designed to handle harsher conditions compared to other types of pallet racking. Suitable for external applications and harsh climates, galvanised pallet racking can store a wide spread of palletised products. Narrow Aisle Pallet Racking: This type of pallet racking optimises space by keeping the aisle width to a minimum and therefore freeing up more space whilst still having the same capacity as other racking configurations. Push Back Pallet Racking: This combines the efficiency of drive-in pallet racking with pallet live storage, therefore allowing you to access pallets that are four pallets deep from one face. Very Narrow Pallet Racking: This type of pallet racking is ideal for warehouses with minimal space. It has aisles ranging from 1.5 – 1.6 metres, saving nearly half the space you have. Wide Aisle Pallet Racking: This is the most commonly used type of racking, storing your stock horizontally with 2.5 – 4.0 metre aisles in between each rack. pallet racking, storage systems. permalink.